The crisis in Kashmir is at a crucial stage. Our actions at this juncture will not only decide the fate of Kashmir and India but of entire South East Asia. In the last few days we have seen a sudden spate of views not just by left liberals but also by centrists like Vir Sanghvi and Swaminathan Aiyar suggesting secession of Kashmir from India. It is really baffling to see them suggesting this just because demand for secession has increased in the last few days. Was the merger of Kashmir with India unjustified ? Swaminathan Aiyar questions the merger of Kashmir with India by comparing the merger of Junagarh with India. He conviniently forgets that India is a secular country wheras Pakistan is a theocratic state. A Hindu majority region could not have merged with Muslim Pakistan. Muslim majority region could merge with India because India is a secular state. Mahatma Gandhi, Jawaharlal Nahru, Sardar Patel and millions of Hindus and Muslims who stayed back in India, did not approve of Two Nation throry and that was the reason India remained secular. If Kashmir secedes from India just because it is a Muslim majority state, it will validate Two Nation theory and pave way for India to become a Hindu Rashtra. Besides, Two Nation Theory was debunked in 1971 with secession of Bangladesh from Pakistan and continuous illegal immigration of crores of Bangladeshis in India since then. Invoking Two nation theory to support secession today is devoid of any logic. Is Kashmir a colony of India ? Swami has went a step ahead and compared Kashmir to British India. This despite the fact that Kashmir is the only Indian state to recieve almost 100% funding from Central Government for its five year plans. The poverty level in Kashmir is lowest of all Indian states. A state like Bihar, which is one of the most backward state in the country, gets per capita central assistance of Rs 876 per year. Kashmir gets over ten times more: Rs 9,754 per year. It is the only Indian state to recieve special privileges under Article 370 that bars any non Kashmiri Indian from buying property in the state. Ofcourse, Kashmiris are free to buy property anywhere in the country. Now which “colony” in the history of the world was so pampered ? Vir Sanghvi rightly mentions that most elections held in Kashmir were not as free and fair as in rest of India. But how can this argument be used to merge Kashmir with Pakistan, which has been under dictatorship most of the time since its existence ? Even democratic Governments in Pakistan were always under the shadow of Army and no one can deny that even today Army and not the civilian Government is the most powerful establishment in Pakistan. So if Kashmir merges with Pakistan, would it get any special democratic right which is not enjoyed by the rest of Pakistan? Besides the status of Human Rights in Pakistan Occupied Kashmir should give an inkling to Kashmiris about the state of affairs in Pakistan. Compared to PoK, violation of Human Rights is far less in J&K as said by European Union, Human Rights Watch and other agencies. What if Kashmir secedes ? Most probably we would see a repeat of communal violence that engulfed the nation in 1947, if Kashmir secedes. The only difference would be that now we do not have a Mahatma Gandhi who could soothe communal tensions. Secession of Kashmir would open a pandora’s box and we would see similar demands from other regions in the country. When Raj Thackeray says that Maharashtrians have first right over any job created in the state, he is bashed by all and sundry (and rightly so), however we would see a Raj Thackeray in each state of India who would have some or the other grievance. Ironically, the same people who harshly criticise Raj Thackeray (and rightly so) do not find anything wrong with the seperatists of Kashmir !!! As mentioned above, Kashmir’s economy is heavily dependent on Central Government’s aid. An independent Kashmir would be as successful as Pakistan or Bangladesh are today. Crores of Bangladeshis have already made India their home illegally. There is no strong reason to believe that the same story wont be repeated with Kashmir. Pakistan would obiviously try to annex Kashmir, which would be resisted by a strong section of Kashmiris and this will only make the entire South East Asia more unstable. There is no quick fix. The Government needs to take all affected parties into confidence and resolve the Amarnath dispute, which triggered the current crisis. Even if Amarnath land transfer issue is resolved, we need to make a road map for a permanent solution. Pampering Kashmir with special status and a generous central financial assistance hasn’t worked. Financial assistance need not be stopped as the state is victim of terrorism, however Article 370 is part of the problem and not the solution. It is very important that Kashmiris mingle with people from rest of the country and Indians accept them as their own. But you need two hands to clap. Kashmir should be as open to rest of the country as is any other state. Abolishing Article 370 will bring Kashmir and India closer. This ofcourse is not the right time to abolish it but the Government should have a concrete road map to do so. Barring the two elections of 1977 & 2002, all elections in Kashmir are alleged to be rigged. We need to make sure that such mistakes are not repeated and Kashmiri participation in democratic processes is as good as any other state in the country. In short, Kashmiris should be encouraged to join mainstream India but not at the cost of injustice towards rest of India. As Muzaffar Razmi said, Yeh Jabr Bhi Dekha Hai Tareekh Ki Nazron Ne, Lamhon Ne Khata Ki Thi Sadiyon Ne Saza Payee (History is witness to incidents where mistakes were made during split seconds for which entire generations had to pay the price till centuries). The Indian sub continent is still paying the price for the khata (mistake) made in 1947. Let us learn something from that mistake rather than repeat it. This entry was posted in india, kashmir and tagged amarnath, india, kashmir, land transfer, pakistan, partition, two nation theory. Bookmark the permalink. I completely agree on scrapping Article 370. Its more of a bane than boon. Moreover, having a strong leadership is of paramount importance if we are to see a solution to this gigantic problem. At present, I am doubtful of the leadership. It is indeed sad that a set of people are suffering for no reason of theirs..I wonder what on earth and heaven above made Hari Singh,not join with India or Pakistan during 1947..A single decision ruined life of generations,and may continue to be so .. Politicians today are not interested ,as they are the ones who benefit the most from such troublesome spots..We,the aam insaas,should do something and bring about a change,in the right direction..
See,we are helpless,we can just make comments..Who is listening to us?? Also,it is sad that people living in all luxury,sit in a/c rooms and make comments about Kasmiris not being loyal and faithful to India..We don’t know why such systemic violence happens over years..I guess,the physical mental and physological tortures,we give them are well enough to justify what they do..See their women getting raped,husbands and brothers disappearing..I think they are doing it out of desperate minds.. Yes, I agree that we need a strong leadership if we wish to find a long term solution. Thanks for your comments. I feel in addition to Roti, Kapda aur Makan, dignity is also necessary. We need to make sure that rest of India treats Kashmiris as their own. I dont think they are discriminated against on a large scale but whatever little discrimination they face, if we can do away with it, it will definitely help in Kashmir’s full integration with India. I went thru ur point vikas… i wish that kashmir stays with india..no other country can do what india does for kashmir… but their help is only economical… everyone one hates terrorism..lets take gujrat, for example, not more than 1000 ppl would have died in terror related incidents..but they hate terrorism the most.. now for us the Indian security forces are terrorists.. they misuse the poer given to them…thousands of fake encounters for mere promotions.. last year an innocent student was killed and later branded as an let terrorist..the soldier who killed him got 2 lakh rs. and a promotion for killing an innocent life..we all demand that indian security forces should move out and jnk police should take over.. I believe anyone who is responsible for killing innocents should be punished, whether it is army or terrorists. I think army is also doing its best to punish human rights violaters. A lot of court martials have happened in the valley. I am sure you would be aware of that. I hope all human rights violators are brought to justice. hello….being a kashmiri i was really impressed with all the comments that have been made so far.u c the things can b solved in such a way but not the way the govt of india is usin right now.i hop u agree with me on this point………i would rather love being wid india but rest of the country should also feel the same for us……. There are no human rights in the valley..we are killed like cattle here.. we also have seen a trend few years back that u would hate your army.. they used civilians as shields in encounters…we lost many ppl in this way..and then the army clarified its stand by saying that they were caught in gunfire..
You need not be proud of ur army for killing that student.. he was a student of Amar Singh College…he just was a student union leader.. Comments of Syed Talha and KP have been deleted because of profanity. Guys, please maintain decency and do not use words that you would not like to hear for yourself. I agree the feeling of belongingness should be mutual. And believe me most Indians, I know consider Kashmiris as their brethren. Its sad that a place like kashmir, which should be described as a paradise is more known now as a terror filled, blooded shedded land. Bt seeing the cold waves from the govt side ( though there r sme actions) i dont think it wil b solved in the near future. I doubt whther it wil ever b sold. The feeling of one nation and unitedness should be felt by the ppl in kashmir, but sad thing that the political parties there r more interested in going to the otherside than staying in india. Well the Amarnath land issue seems to be resolved now and I am sure we will see a permanent solution of the Kashmir issue in the near future as well. Not all political parties are interested in “going to the other side”. National Conference still is the single largest party in the valley and I dont think it has shown any interest in “going to the other side”. Let us not generalise and not forget that many National Conference workers have lost their lives to terrorism in the past twenty years. We would be doing a great injustice to their martyrdom if we club them with Hurriyat Conference or even PDP. The fact that Kashmiris feel that others Indians don’t think of them as their brethren shows how miserably our Govt. and all initiatives have failed. It’s very important to promote people- to -people contact to do away with such issues. why do you all call us terrorists.. we havent killed any outsider here..we treat u like our guests. everyone one of you who visits here lauds our atitude but as soon as u leave kashmir, u start cursing kashmiris, why is it so? I see only one reason, because we are the only muslim majoruty state… India isnt a secular country.. everyone makes fake claims.. why were 60 kashmiris killed in the agitaion while as only 5 killed in jammu. if any outsider would have visited kashmir last year n asked a kashmiri what he wanted. he would have clearly said that he wud stay with India. but this year india showed its usual indifference towards kashmir and killed ppl. now how can it expect kashmiris to like being with India. y would a kashmiri like to b with india…only to get killed for no fault of his or to face unprovoked wrath of indian security forces….it is very easy to bark from there than to face hardships like we kashmiris do.. I agree with you completely that more people to people contact is necessary and abolition of Article 370 is necessary to fully integrate Kashmir in mainstream India. I hope you are aware that thousands of Kashmiris are getting higher education and are employed in several cities outside Kashmir and in India. Would it have been possible for them to study or work as normal citizens, had they been treated as terrorists? 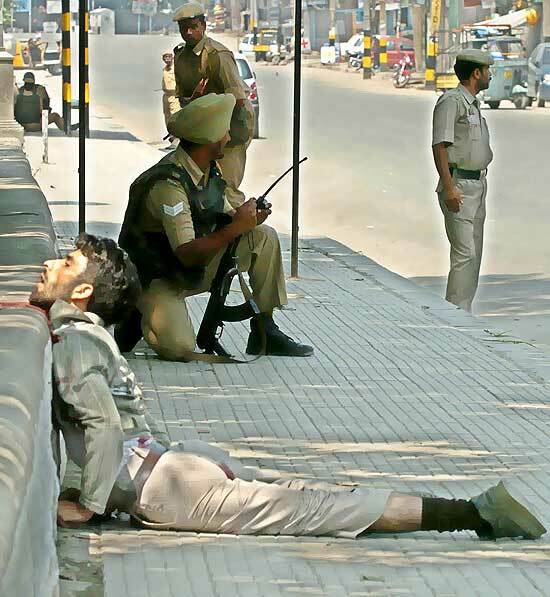 Tell me why kashmiris were showered bullets when they peacefully protested. Whereas in Jammu Army and Police helped rampaging mobs to burn Moslim house…why??????? Your claim that India is a secular country gets punctured when it is kashmir. Who butchered about 90,000 Moslims and 450 Kashmiri Pandits in cold blood. The secession of Kashmir is a poorly conceived idea, the political leadership which today is demanding this separation does not realize that its merger with Pakistan will bring nothing but ruin to the state. We have all seen how much the hold the Pakistani Government has over it’s own land. On what basis do they demand for its accession? As mentioned, a decision taken in a second affects the lives of millions for generations, let us take the view of the people into account for once.